The performance of many business critical applications like Oracle database is often limited by bottlenecks in the infrastructure components—CPU, memory, network, and storage. Although CPU, memory, and network performance has improved dramatically over time, storage performance improvements have lagged due to the limitations of latency and throughput. The Dell Acceleration Appliances for Databases (DAAD) is a pre-built, pre-integrated appliance designed to accelerate leading database environments such as Oracle Database. This appliance combines Dell PowerEdge R720 Server, Dell networking, and ioMemory cards and ION Accelerator software from Fusion-io to improve database performance. • The appliance is built on the industry leading Dell PowerEdge R720 server. in the PCIe slots of the R720 server. These cards are also known as ioMemory cards. scalability across multiple appliance nodes or multiple pairs of HA Clustered appliances. To ensure the high availability of the infrastructure, it is recommended that network and storage IO paths are redundant. The following diagram shows the architecture of Oracle RAC database implementation based on DAAD as the shared storage. The whitepaper that I co-authored with two other engineers in my team last July describes the reference architecture of an Oracle database and DAAD pairing, and showed the analysis of performance improvement of the Oracle database based on this architecture. The solution described in this whitepaper here is a high-availability-enabled, two-node appliance that uses the Fibre Channel storage protocol. 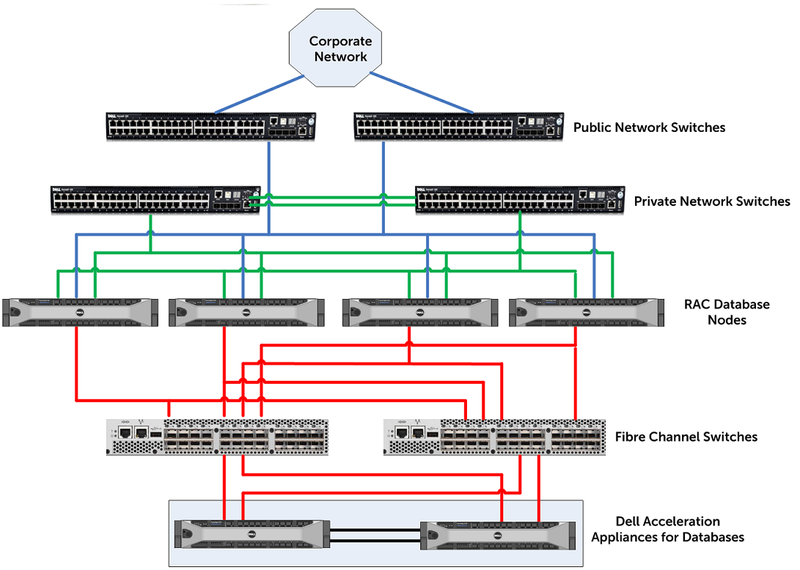 Each appliance node is comprised of a Dell PowerEdge R720 Server, four 3.0TB ioMemory flash cards with the ION Accelerator software installed, and high availability ION clustering enabled. The highly available two-node appliance solution provides 12TB of redundant tier-1 storage capacity with a total of 24TB of raw storage capacity. The storage appliance delivers over 1 million random read IOPS with 0.5 millisecond latency for 4k random read which equates to 27 times the IOPS and 4% of the latency that 96x 15k conventional drives can provide. On HammerDB’ s TPC-C-like performance studies, the four-node Oracle RAC database on the two-node appliance can deliver 960,000 peak New Orders per Minute (NOPM) and over 2.5 million Transaction Per Minute (TPM).